With a bizarre, unique style in role-playing games today, "Paper Mario" has potential to be one of your favorite RPGs. Welcome to the world of "Paper Mario!" The story starts off with Mario being invited to his friend Peach's castle for a party. As they approach the castle and chat with some of Peach's Toad underlings, Mario finally arrives at Peach's castle. All of a sudden, the castle is torn from the ground causing an earthquake, shaking Toadtown! As the castle rises to a sky with a familiar machine carrying it, Bowser comes out of the shadows laughing. After some trash-talking, Mario and Bowser begin to battle. As victory neared, Bowser revealed a rod to everyone -- the Star Rod! Bowser uses this Star Rod and zaps Mario out the window. Mario glides down as if he were a piece of paper and is knocked out. Mario, your adventure begins here! "Paper Mario" is absolutely overflowing with style. Something like this has never been done before in any type of genre in gaming today. 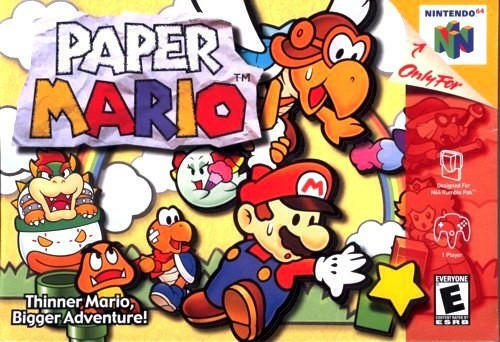 In this Mario game, the supporting characters and Mario are made of paper. With a 3D background and 2D characters, the paper characters add a very unique style to this fun game. The backgrounds are not anything to be marveled over, but they still manage to capture the classic Mario world. The graphics play a role in the game as well. 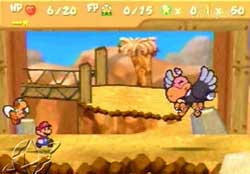 For instance, when Mario goes to rest, he flies up in the air as if he was a piece of paper and slides under the covers. Mario can even do a little spin dash -- he will glide like a piece of paper when you do this. The music may be hit-and-miss with a lot of people. While there are some new, there are also some old, familiar themes -- like the classic Mario theme. There isn't all that much to describe about the music. It isn't one of the game's strong points. In fact, this probably one of the worst parts of the game because the themes are quite annoying. While it doesn't bring down the game dramatically, it doesn't help it either. The actual gameplay is really where this game hits. Players can actually get into this RPG within the first twenty minutes of playing. The controls are responsive and easy to adjust to. The enemies are totally viewable from the screen before you encounter them, which make the game more enjoyable. There are two ways to get the first strike on Mario's foes --you either hit them with your newly found hammer, or you jump on them. Once in battle, Mario can do several things. He has the ability to use an item, use his hammer, or jump on his enemies. With the hammer, players will have to hold the analog stick left until the circle lights up. With his jump ability, you will need to hit A, landing on them for extra damage. Other characters can do extra damage also, but you will have to play the game to find out how. You will be amazed at what kind of crazy characters accompany Mario. Mario can equip badges in this game, which allow him to learn new abilities. Like most other role-playing games, "Paper Mario" features a lot of sidequests and mini-games. I won't spoil any for you, but I will tell you that you will have a blast with each and every one of them. Though the game lags a bit in Toadtown, the experience is still just as enjoyable. As with any other Mario RPG, this game has AWESOME dialogue. It almost can't be put into words how hilarious it is the way characters talk can be. My favorite terms of speech are from the Goomba King -- all the letters shake uncontrollably in his text box when he talks. The Koopa Bros. (Teenage Mutant Ninja Turtles rip-off) are funny in addition to the Goomba King. The controls are great, the graphics are satisfying, the music is less-than-stellar, and the gameplay is where "Paper Mario" truly shines. This game gets my thumbs up. Also, Paper Mario 2 comes out this Fall (2004). Don't miss out on this one either!